The maximum temperature on Saturday was 32.8ºC and the minimum 27.2ºC. The maximum relative humidity was 93 per cent and the minimum 68 per cent. Rainfall: Rain or thundershowers have been reported at many places in east Rajasthan and Uttaranchal, at a few places in west Rajasthan and west Uttar Pradesh and at isolated places in the rest of the region. The chief amounts of rainfall in mm are: Haryana: Delhi Ridge and Tajewala 2 each and Karnal and Thanesar 1 each; Himachal Pradesh: Rajgarh 5 and Kasauli and Nahan 1 each; Jammu and Kashmir: Batote 2; Punjab: Adampur 2; east Rajasthan: Pipalda and Shahbad 6 each, Baran and Ghambhiridam 5 each, Mangrol 4, Anta, Angucha, Railmagra and Umedsagar 3 each, Indergarh 2 and Dholpur and Nainwa 1 each; west Rajasthan: Sangaria 4, Barmer 2 and Nal 1; east Uttar Pradesh: Bhinga 12, Kakardharighat 9, Bhatpurwaghat 2 and Chillaghat and Shardanagar 1 each; west Uttar Pradesh: Auraiya 4, Hindon 2 and Hamirpur and Shahjina 1 each; and Uttaranchal: Dehra Dun 4, Joshimath and Rudraprayag 2 each and Banbasa and Hardwar 1 each. Forecast valid until the morning of August 11: Rain or thundershowers are likely at many places in Himachal Pradesh, east Rajasthan, east Uttar Pradesh and Uttaranchal, at a few places in Haryana, Punjab and west Uttar Pradesh and at isolated places in the rest of the region. Heavy rainfall warning: Isolated heavy rain is likely in Himachal Pradesh, east Uttar Pradesh and Uttaranchal during the next 48 hours. 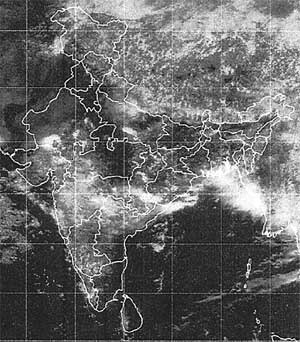 Forecast for Delhi and neighbourhood valid until the morning of August 11: Mainly cloudy sky with rain or thundershowers in some areas. Farmers’ weather bulletin for Delhi forecast valid until the morning of August 11: Light or moderate rain is likely at a few places.